Table tops in marble or Cudappa black stone with detailed inlay work with colored stones and semiprecious gemstones define the richness of design and the artwork. We possess a collection of these in different shapes and styles. 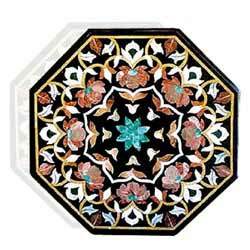 Floral designs, inlaid on a Cudappa Black stone, that dazzle with the richness of marble add grandeur and a dash of class to this octagonal table top. 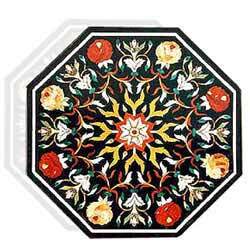 Vibrant colors and effervescent floral design on this octagonal table top has been excellently inlaid with distinction on cudappa Black stone. 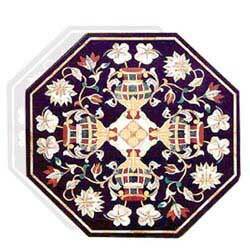 The inlay design on this octagonal table top has been privileged with the king of all flowers, LOTUS. 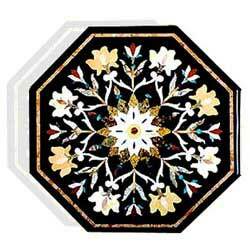 This gorgeous pattern has been inlaid on a Cudappa Black stone. Let this octagonal table top is a reflection of our aesthetic sense and inherent craftsmanship. 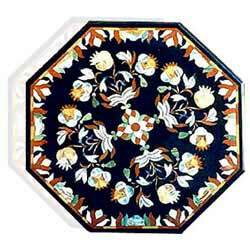 The Lotus and floral design has been intimately inlaid on Cudappa Black Stone. 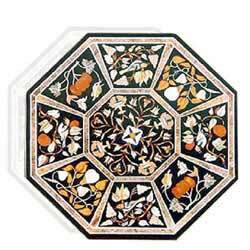 Floral patterns in contrasting color combinations add to the artistic appeal of this octagonal table top, inlaid on Cudappa Black stone, which reflects the rich legacy of Indian art! 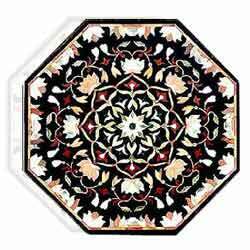 A very usual floral pattern with a very unusual hue selection for inlay work on Cudappa Black stone has made this octagonal table top a work of genius. 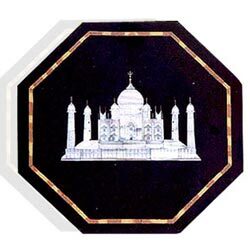 We present to you one of the wonders of inlay work as "Taj Mahal", one of the seven wonders of world, has been captured as an inlay design on this Cudappa Black stone to guard the royalty of the bygone era.